The North Branch flows southeasterly passing through Lovells eventually emptying into the Mainstream a few miles downstream from the South Branch. The North branch is also a quality fishery with a section devoted for fishing with artificial flies only from Sheep Ranch downstream to the confluence with the Mainstream. This is a beautiful river with slick pools and quality trout. 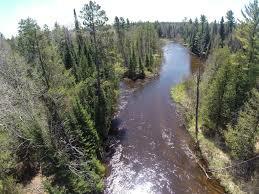 It is a great dry fly fishery like the rest of the upper Au Sable River system. Access can be gained in many areas along the North Branch's path.